Join us to learn about the Enterpryze Omnichannel Suite, a Mobile and Cloud simplified ERP that integrates SAP Business One and Square for Retail. Morgan Browne, CEO of Enterpryze, will provide an overview and demo of the Enterpryze Omnichannel Suite. This cloud-based ERP suite provides users with the back office power of SAP Business One fully integrated with the omnichannel elegance of Square for Retail. It can be licensed for $75/month/user and takes only minutes to get started. Join us to learn about SAP Business One, and how its features complement Square for Retail. Moty Moshin and Idit Saguey, Business One Solution Experts at SAP, will provide an overview of SAP Business One and describe how its powerful back office features complement the elegant front office features of Square for Retail. Join us to learn about Square for Retail, and how its features complement SAP Business One. Antonio Silva, Head of Platform Partnerships at Square, and Carrie Zhang, Head of Product Marketing, Point of Sale at Square will provide an overview of the Square for Retail app and explain how its elegant features complement the power of SAP Business One. 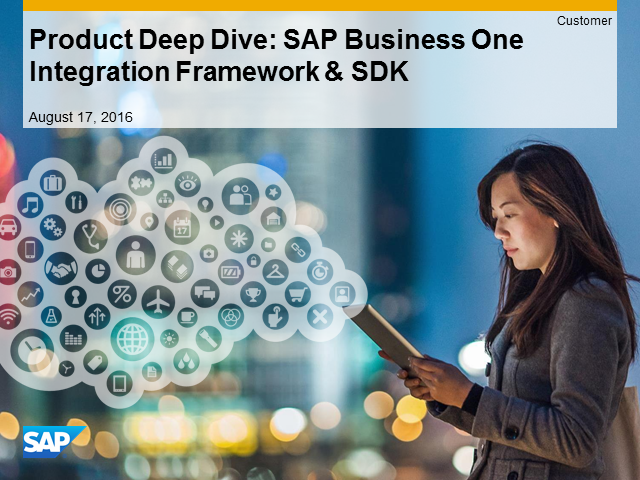 Join us for a Technical Deep Dive on the architecture and features supported by Square’s integration with SAP Business One. Steve Tait, Head of Business One North America, SAP and Antonio Silva, Head of Platform Partnerships BD, Square, Inc.
Join us to learn the business value for high growth retailers of the combination of SAP Business One + Square for Retail. Antonio Silva, Head of Platform Partnerships Business Development at Square, and Steve Tait Head of North America Business One for SAP will describe how the combination of SAP Business One + Square for Retail can enable high growth young retailers to both innovate and manage the core processes of their businesses as one. The elegance and ease of Square in the front office combined with the power of Business One in the back office empowers businesses to run simple in ways that weren’t possible previously – join us to learn how to gain these benefits for your business. This webinar is intended for developers and product managers. This first webinar is intended for business decision makers, to learn how SAP Business One can enable you to transform your distributor channels by standardizing their processes and their integration with SAP Business Suite, using SAP Business One. SAP Business One is an affordable, easy-to-implement business management platform designed specifically to meet the needs of growing small enterprises, and subsidiaries of large enterprises. A platform trusted by over 50,000 customers in 150 countries to give managers on-demand access to critical real-time information through one single system containing financial, customer relationship management, manufacturing, analytics, and management control capabilities. And, SAP Business One is an open platform utilizing leading-edge technologies for cloud, mobile and in-memory database that integrates easily with other SAP products, as well as to the applications and services that comprise your whole product solution.